Southern Comfort is a fruit, spice and whiskey flavored liqueur made from neutral spirits and produced since 1874—though not always by the modern formula. The brand was created by bartender Martin Wilkes Heron in New Orleans, when he wanted to make a better tasting whiskey. 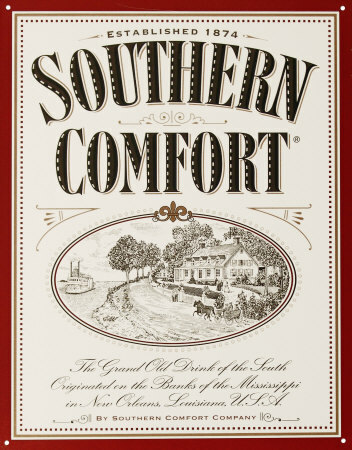 Southern Comfort has expanded over the years and has several product offerings globally. In the US Southern Comfort is available as 100 US proof (50% alcohol by volume), and 70 US proof (35% alcohol by volume). Southern Comfort Special Reserve, found in duty-free shops, is a blend of Southern Comfort and bourbon, and is 80 US proof. Southern Comfort also produces Ready-To-Pour cocktails available in the US including Southern Comfort Sweet Tea, Southern Comfort Hurricane and Southern Comfort Lemonade, which are all 30 proof (15% alcohol by volume). Southern Comfort Lime released in the Summer of 2010 is 55 proof (27.5% alcohol by volume). Outside the US, Southern Comfort produces single-serve cocktails including Southern Comfort Lemonade and Lime in the UK, and Southern Comfort and Cola in Australia. The Brown-Forman Corporation owns the Southern Comfort brand. Outside of the Americas, Southern Comfort is produced and bottled in Dublin, Ireland. Southern Comfort was first produced by Irish bartender Martin Wilkes Heron (1850–1920), the son of a boat-builder. Legend says it was created and sold at McCauley’s Tavern at the corner of Richard and St. Peter Street in the French Quarter of New Orleans, Louisiana. However, St. Peter Street and Richard Street do not intersect, though Richard Street does intersect with S. Peters Street in the Lower Garden District near the Mississippi River. According to the New Orleans Convention & Visitors Bureau, McCauley's Tavern was "just off Bourbon Street," and the original form of the drink was called "Cuffs and Buttons." Heron moved to Memphis, Tennessee in 1889, patented his creation, and began selling it in sealed bottles with the slogan "None Genuine But Mine" and "Two per customer. No Gentleman would ask for more." Southern Comfort won the gold medal at the 1904 World's Fair in St. Louis, Missouri. In an episode of The Thirsty Traveler entitled "A River of Whiskey," spirits historian Chris Morris describes the original recipe of Southern Comfort. Heron began with good-quality bourbon and would add: "An inch of vanilla bean, about a quarter of a lemon, half of a cinnamon stick, four cloves, a few cherries, and an orange bit or two. He would let this soak for days. And right when he was ready to finish, he would add his sweetener: he liked to use honey."